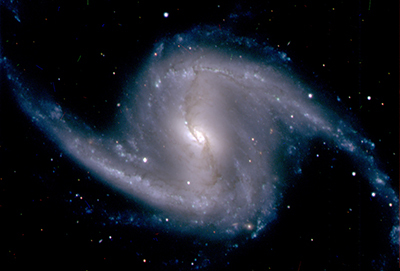 Zoomed-in image from the Dark Energy Camera of the barred spiral galaxy NGC 1365, in the Fornax cluster of galaxies, which lies about 60 million light years from Earth. Credit: Dark Energy Survey Collaboration. COLUMBUS, Ohio -- Ohio State University researchers developed the software that will run a powerful new camera designed to answer one of the biggest mysteries in physics. The Dark Energy Camera (DECam), located on a mountaintop in Chile, took its first photos of the night sky this week. The camera will help researchers involved in the Dark Energy Survey (DES) to explore why the expansion of the universe is speeding up. As the world's most powerful camera, the survey's DECam creates images with file sizes as large as 1 gigabyte as it photographs wide swaths of the sky. This presents astronomers with a problem: how to quickly transfer the data from one giant image out of the camera so the next image can be taken -- while still preserving all the detail that's critical to the survey's mission of mapping the universe's dark energy. Because of new software developed at Ohio State University with partners in the DES collaboration, DECam will be able to save each 1-GB image in less than 18 seconds -- a significantly shorter time than previous astronomical cameras, according to Klaus Honscheid, professor of physics at Ohio State. Honscheid led the software team, which also designed a web-based user interface so that astronomers can operate DECam remotely from around the world, and and the instrument control system that monitors and records every operating parameter of the camera. Control software is obviously not the most exciting aspect of the Dark Energy Survey, Honscheid said, but it is critical to making DECam work. It enables the precision measurements that are necessary to helping the survey achieve its goals. "Shortening the time between exposures improves the survey's overall efficiency, which will enable the collaboration to survey 5,000 square degrees of the southern sky in 5 optical filter bands in just 500 nights," he added. The camera's 74 CCDs are arranged in a grid. As light from distant stars and galaxies enters the camera, each pixel will convert the light to electrons -- the actual "stuff" of the image data. Then the electrons are removed from the array to make room for the next image. They flow out of the CCDs one row of pixels at a time. The collaboration will survey 5,000 square degrees of the sky in just 500 nights. If the electrons are removed too quickly, image noise will appear and ruin some of the information. But if they are removed too slowly, astronomers have to contend with gathering fewer images each night, and the survey becomes less efficient overall. By processing millions of virtual test images, the software team was able to write algorithms to optimize data flow for the images they expect to get from DECam. An 18-second "readout" time proved the best for preserving survey-quality images while keeping telescope time on schedule. Colleagues at Ohio State participating in the Dark Energy Survey include Terry Walker, professor of physics, and David Weinberg, Paul Martini, and Christopher Kochanek, all professors of astronomy. Ohio State's Center for Cosmology and Astro-Particle Physics (CCAPP) plays a critical role in the survey, with five current and former CCAPP Fellows participating: Peter Melchior and Eric Huff of Ohio State, Tim Eifler (now at the University of Pennsylvania), Michael Mortonson (now at the University of California, Berkeley), and Eduardo Rozo (now at the University of Chicago). CCAPP also contributed funds to the construction of the DECam optics. The Dark Energy Survey is an international collaboration supported by funding from the U.S. Department of Energy; the National Science Foundation; funding agencies in the United Kingdom, Spain, Brazil, Germany, and Switzerland; and all participating institutions. More information is available at the project website. Editor’s note: Honscheid is currently in Chile, and best reached by email. Images and a news release detailing the Dark Energy Survey are available from Fermi National Accelerator Laboratory.